The wooden beads of this rakhi are made from the naturally fallen branches of trees from the sacred gardens of Gurudev Siddha Peeth. They contain the energy and blessings of the sacred abode of Siddhas. A rakhi is a sacred thread that sisters tie on their brother’s wrist on Raksha Bandhan. It symbolizes the sister’s love and prayers for her brother’s well- being, and the brother’s lifelong vow to protect her. On the Siddha Yoga Path, a rakhi evokes remembrance of the bond of love and protection between Guru and disciple, as well as the bond among seekers. 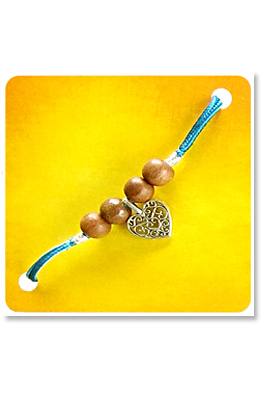 Many Siddha Yogis tie rakhis on each other’s wrist, representing a bond of love and protection. Offer this rakhi to Shri Guru, to your near and dear ones and to yourself acknowledging Guru’s grace and protection in your life.